Spend two nights at a beautiful resort tucked away in the corner of Himachali mountains and enjoy the traditional camping experience with all the glamorous luxuries of the modern world. For two night, you’ll stay in large tents pitched at a hillside resort and participate in a host of activities. You can try your hand at adventure activities like Burma Bridge or play games like table tennis or badminton. You can also simply put up your feet and relax in the swimming pool, visit the mini-theater or revel in mountain views of Himachal Pradesh. Located in the lower hills of Himachal Pradesh, surrounded by pine forests, this resort campsite in the village of Gandhigram. 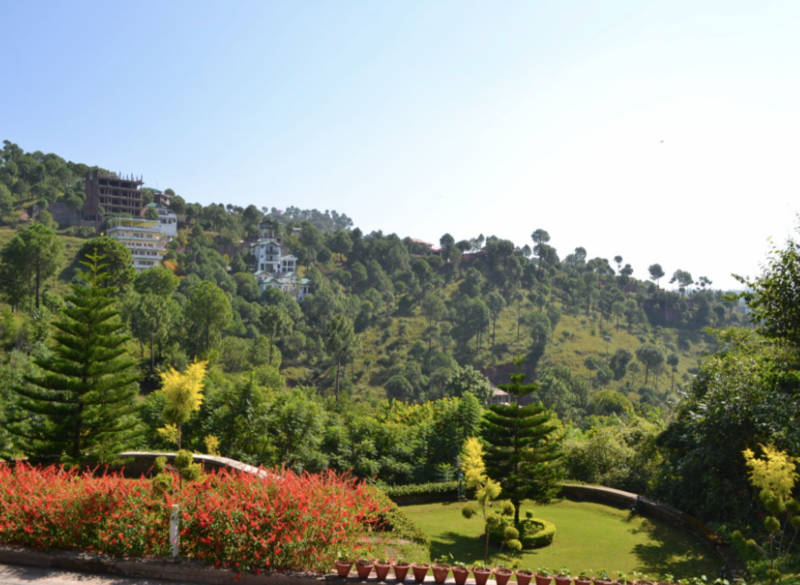 Accessible via a 3-hr drive from Chandigarh, it is located conveniently located to take you away from the city lights and into beautiful, mountain greenery on a short itinerary. You’ll be staying in large tents pitched to provide an experience of glamping, a portmanteau of glamorous and camping. The tents are equipped with attached washroom, television, mini-fridge, double bed, tea/coffee maker, table and chair. 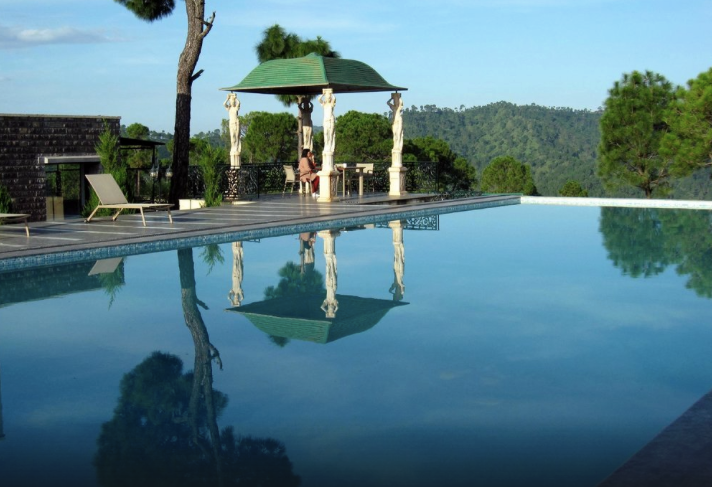 • Go glamorous camping, or glamping in Himachal Pradesh. • Participate in adventure activities like Burma Bridge, rope course and more. 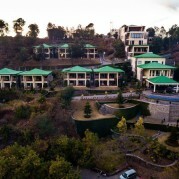 • Spend two nights in the mountains and forests of Himachal Pradesh. • Visit the mini-theater or take a dip in the swimming pool. Glamping in Himachal Pradesh is a non-strenuous activity. However, if you have any cardiac or respiratory conditions, or suffer from knee or spinal problems, please consult your doctor before booking this trip. Travellers are required to follow instructions of the adventure guide while undertaking any adventure activity during the trip. For cancellations more than 15 days before check-in date of the Himachal Pradesh glamping trip: 100% refund. For cancellations between 8-15 days before check-in date of the Himachal Pradesh glamping trip: 50% refund. For cancellations made less than 8 days before check-in date of the Himachal Pradesh glamping trip: No refund. Refund policy may differ during long weekends, festivals and holidays. Please note that check-in time is 14:00 hrs, while check-out time is 11:00 hrs. Meals are served in the common kitchen/dining area in fixed time slots: breakfast between 07:00-10:00 hrs and dinner between 20:00-22:00 hrs. Travellers younger than 6 years old are allowed to stay at no extra cost, without an extra bed/mattress. However, travellers between the ages of 6-12 years is charged at a discounted rate of INR 3,000 per person, with an extra bed/mattress. Travellers older than 12 years are charged at full price. Accommodation for drivers/staff is not available, but assistance for making alternate arrangements can be provided at the front desk. Travellers need to pre-register at the front desk to use the mini theater. Travellers younger than 18 years are not be allowed to use spa services. There is no pick-up point for this Himachal Pradesh glamping trip. There is no drop-off for this Himachal Pradesh glamping trip. Day 1 of glamping in Himachal Pradesh: Check-in and enjoy! Arrive and check-in to the campsite by 14:00 hrs and get refreshed in your tents. You can spend the rest of the day at leisure. Take some time to explore the glamping campsite. You can visit the mini-theater to watch movies along with your friends or family. You can also just relax by the swimming pool or play a game of table tennis. Gear up for a fun day of adventure activities for tomorrow! Overnight in tents at the campsite. Live in tents pitched to give you great views of the valley. Wake up and prepare for a day of adventure activities. You can try your hand at rope courses with activities like Burma Bridge, hanging loops or hanging planks. Fun for your entire group, you can also participate in gully cricket or badminton games and end day with a relaxing dip in the swimming pool. Overnight in tents are the campsite. Green mountain views of the campsite. Wake up and take a morning walk to get serene morning views of the campsite. You'll check out of the campsite by 11:00 hrs. Depending on availability, you can even extend your stay at the campsite. Your trip ends here. 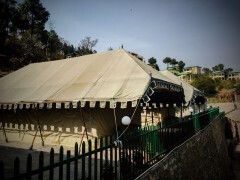 Large tents with attached washroom and double bed. Check-in time at the campsite is 14:00 hrs. Today's meal package includes dinner at the campsite. You'll be accommodated in tents on twin-sharing basis. The tents are equipped with attached washroom, television, mini-fridge, double bed, tea/coffee maker, table and chair. Inside views of the tents: with attached washroom and bedside table. Today's meal package includes breakfast and dinner at the campsite. You'll be accommodated in tents on twin-sharing basis. The tents are equipped with attached washroom, television, mini-fridge, double bed, tea/coffee maker, table and chair. Inside views of the tents: with double bed and television. Today's meal package includes breakfast at the campsite. Check-out time at the campsite is 11:00 hrs. Depending on availability, you can even extend your stay at the campsite. The glamping campsite is located about 2-hr drive away from the Kalka railway station and 3-hr drive away from the Chandigarh Airport. You may board a train to the railway station or a flight to the airport and travel to the campsite in private cab/taxi.